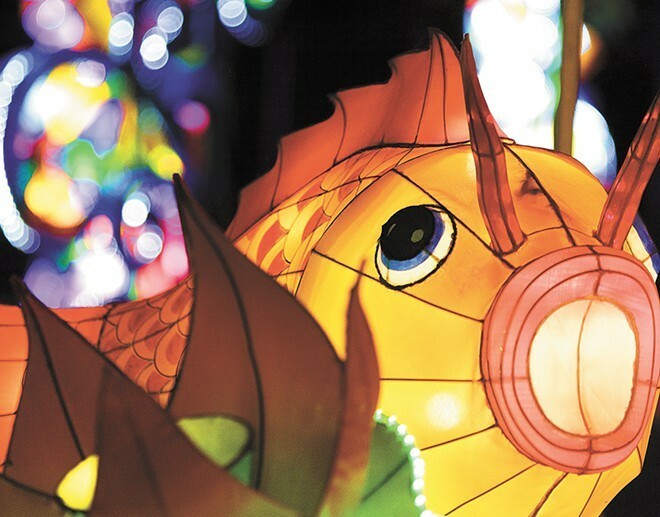 The Chinese Lantern Festival has been extended now until Nov. 15. The inaugural Washington State Chinese Lantern Festival has been so successful since it opened in late September that it's being extended through November 15. That's an extra two weeks added to the originally planned five-week run. Recently the Inlander reported that festival attendance has greatly surpassed projections, with tens of thousands of visitors from across the region coming to see the handmade, illuminated sculptures from China placed throughout Riverfront Park. For the additional weeks, ticket prices ($12-$17) and festival hours are to remain the same. Nightly performances of Chinese dance, acrobatics and music also are to continue on a stage in the park's Lilac Bowl. In honor of Veteran's Day, on Nov. 11 all military veterans can come see the displays at no charge. A few components of the event, however, will change due to the unforeseen schedule change. Traditional Chinese art displays and artisan vendors won't remain on site, and the menu at the pop-up Chinese restaurant Deng Chu is set to alter. The final weeks of the five-week tour of Chinese cuisine, created and prepared by renowned Spokane chef Jeremy Hansen, continues this weekend and next. The current menu, offered tonight and tomorrow, highlights the spicy and flavorful food of China's Sichuan region, followed by the light and mild cooking of the Shanghai region. Dinner service for these fixed price menus ($25/person, plus $14 festival admission) and the Chef's Table option ($100/person, limited seating) is offered Thursday through Saturday, from 5-9 pm. Reservations are filling up quickly, and while you can still dine as a walk-in customer, the final two weeks of Deng Chu's "tour of China" dinners should be pretty packed. Because the festival extension wasn't something Hansen was planning for, the two extra weeks at Deng Chu will not feature these multi-course meals, confirms his wife Kate Hansen, who runs the operational side of the couple's Spokane restaurants. Instead, the restaurant will be open just on Friday and Saturday during the added weekends of Nov. 6-7 and Nov. 13-14, and for walk-in diners only. The Chef's Table experience also won't continue, but Kate Hansen says there will be more food and price options for customers since the fixed-price menu isn't continuing. Also offered alongside the food is a beverage menu featuring cold and hot non-alcoholic drinks and tea, as well as Townshend Cellars wine, Chinese bottled beer and three cocktails created specially for the event by the Butcher Bar's Cody Winfrey. As we've said before, if you've been thinking about going to this unprecedented event, don't wait too long because it'll be gone before you realize it.